9 am at St. Peter’s Church on Main Street. Please join us this week for these celebrations of the Holy Sacrifice of the Mass said according to the 1962 Roman Missal. Sunday, Oct. 30, 7:30 a.m., the Feast of Our Lord Jesus Christ the King, followed by the Consecration to the Sacred Heart of Jesus. 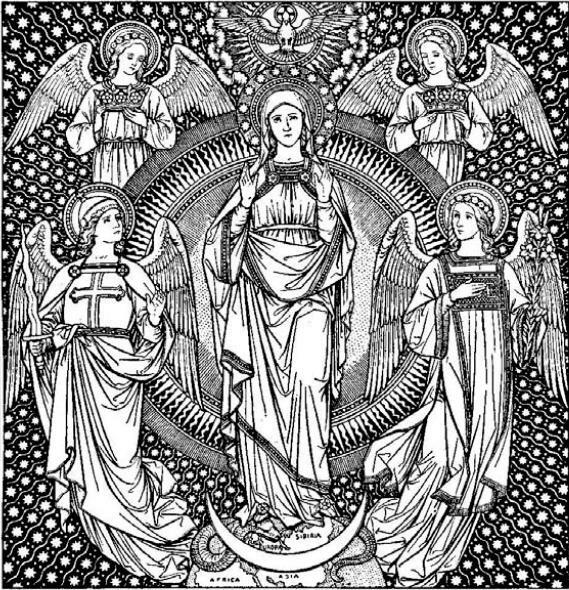 Tuesday, Nov. 1, 9:00 a.m., the Feast of All Saints. As of October 16th, 2011 the regularly scheduled weekly and Holy Day Mass in the Extraordinary Form at St. Mary’s in New Britain has been cancelled. St. Mary’s has been home to the old Mass for four years and the community itself had been worshiping together using the traditional sacraments for over 20 years. The reason for the cancellation is for lack of priests able or willing to celebrate the ancient Mass. Archbishop Mansell has commended any of the parishioners of St. Mary’s attached to the traditional Mass to the parish of St. Peter in Hartford and to the pastoral care of Rev. Dairo Diaz. Father Diaz has been regularly celebrating the Extraordinary Form as a regular part of the parish Mass schedule for a year. Fr. Diaz welcomes those who attended Mass in New Britain and any other Catholics attached to the E.F. to become an active part of St. Peter’s parish. The Mass at St. Peter’s is currently celebrated at 7:30 am on Sundays. In an effort to make it easier for those who need to travel to Hartford for Mass, Fr. Dairo will be scheduling the E.F. Mass at a later hour in the morning come mid November. The time of Masses on Holy Days will vary. 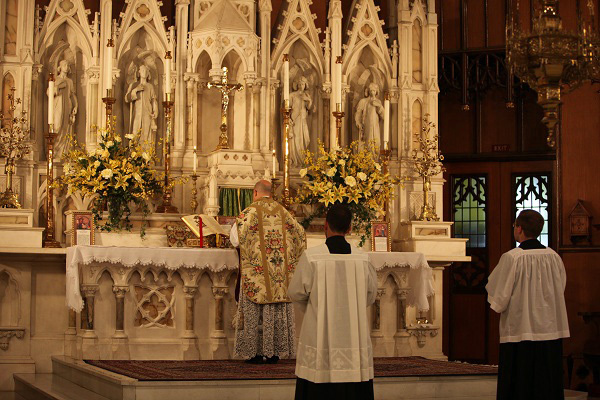 The four years that have elapsed since the effective date of Summorum Pontificum have witnessed an amazing flowering of the Traditional liturgy in this country. While still encountering many obstacles, the Traditional Liturgy continues to acquire new supporters and new homes – often in what previously were thought to be the most inhospitable places. And every Catholic must ask: what does this liturgical ferment mean for the Christian life in the contemporary world? The Society of St. Hugh of Cluny is organizing this conference to take stock of these developments and to provide a broader context for what we have experienced. We will hear extraordinary speakers who, each in a very different way, will provide insights on the political, legal and spiritual dimensions of living Traditional Catholicism today. We also hope that this will be an opportunity for us to get to know each other better and to lay the foundations for continued fruitful cooperation in the work of restoring Christendom. The conference will take place in the church and church hall of St. Mary’s Parish, Norwalk CT. Directions. Parking is available. We would appreciate contacting us at mailto:contact@sthughofcluny.org if you plan to attend. The 4 pm Sunday Mass at St. Mary’s in New Britain is cancelled for this Sunday the 18th. Masses will resume Sunday September 25th. With Fr. Diaz’s return from Rome, the traditional Mass apostolate will resume with Masses on Sunday at 7:30 am and first Fridays at 6:30 pm. Fr. Diaz is studying this Summer in Rome so no Masses will be offered on Sundays or First Fridays until his return. Masses will resume on the first Sunday in September. This Friday, April 1st there will be a traditional Mass in the Extraordinary Form celebrated at St. Peter’s on Main St. in Hartford at 6:30 pm. The Mass will be followed by the Stations of the Cross led by the pastor Fr. Dairo Diaz.